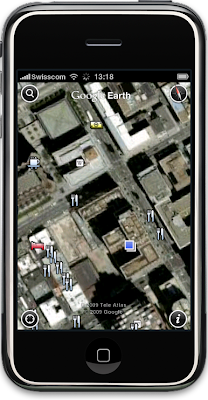 the Google Earth for iPhone application, I've been enjoying my virtual trips around the globe. However, what I find it especially useful for is putting search in a local context. The Google Earth application shows great satellite imagery, which is always handy to get a first impression of a neighborhood. But imagine having businesses displayed on the screen - how helpful could that be to get to know your location better? Today, we added a "Businesses" layer to Google Earth on iPhone, as well as to the "Geographic Web" folder in the desktop Google Earth version. To make them easily discoverable, you'll see them by default when you start the application next time. You'll find businesses like restaurants, bars, banks, gas stations, and grocery stores all just a touch away. 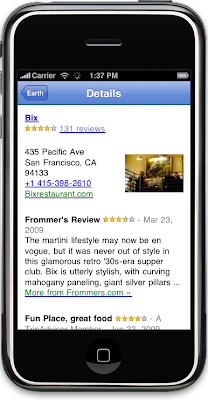 By clicking on the icons, you'll get additional information like the telephone number, reviews, hours, and much more. And don't forget, as you zoom in further, more businesses become visible. Have fun exploring your current location - and let this virtual world help you discover new things in the real world. Since we announced the Google Earth for iPhone application, I've been enjoying my virtual trips around the globe. However, what I find it especially useful for is putting search in a local context.